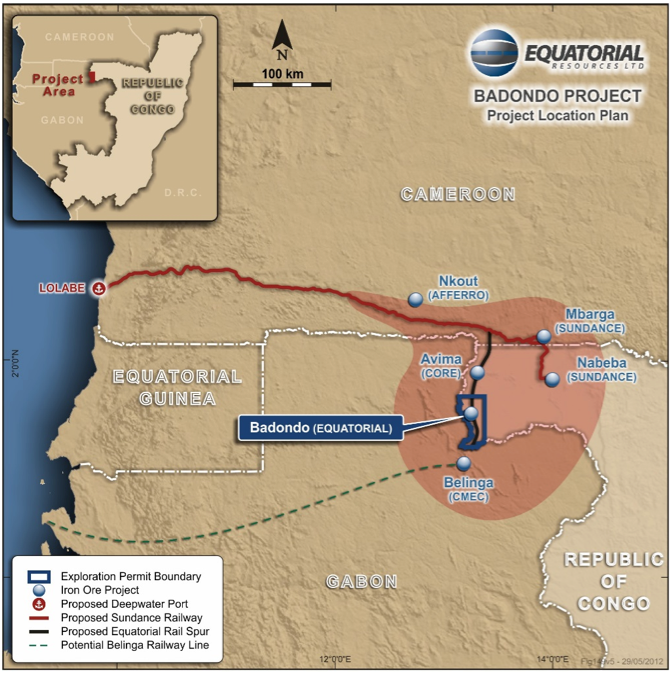 Equatorial is the 100% owner of the Badondo Iron Project, which is held by Equatorial’s 100% owned subsidiary Congo Mining Exploration Ltd SARL. Badondo is a potentially large-scale iron project in the northwest region of the Republic of Congo, within a regional cluster of world-class iron ore exploration projects including Sundance Resources Limited’s Mbalam-Nabeba project. Badondo has a large direct shipping ore hematite exploration target and assay results received to-date have confirmed the presence of thick high grade iron mineralisation at, and close to, surface. The Company has lodged a Mining Licence Application (“MLA”) for Badondo. Under the terms of the Republic of Congo Mining Code, exploration licences are granted for an initial 3 year period and are then capable of being renewed, upon application, for two further periods of two years. The Badondo Exploration Licence was renewed for the second time by Government Decree dated 7 December 2015. Equatorial is now undertaking the process to upgrade the Company’s tenure to a 25 year Mining Licence. According to the Republic of Congo Mining Code, an MLA requires the submission of a feasibility study, an environmental and social impact assessment, community development plans, and the completion of technical reviews by relevant government agencies. On 22 November 2016, Equatorial lodged the MLA for Badondo based on completed exploration work in order to position the Company with a 25 year right to mine at the project. Equatorial will continue to work with the Government with the aim of securing the Badondo Mining Licence during the 2017 calendar year. 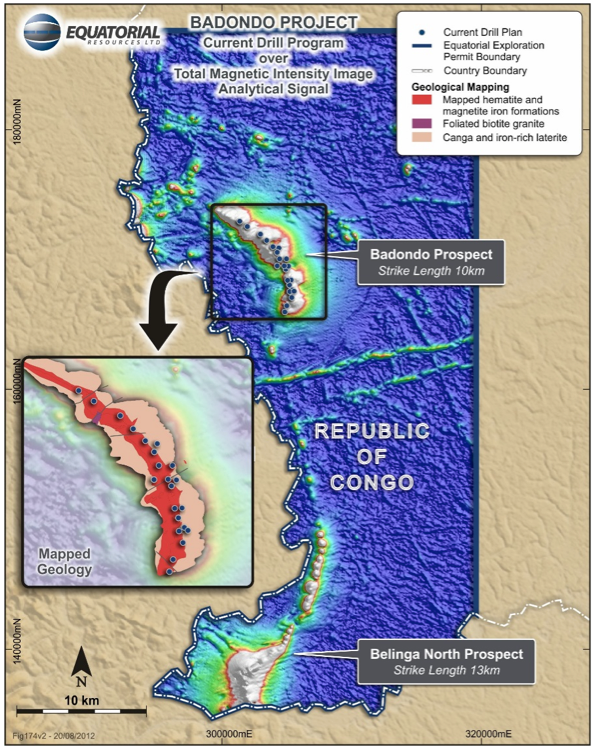 Equatorial has plans for further exploration work at Badondo, which may include a follow-up drilling program. Further exploration and development programs at Badondo will be considered by the Company in the context of the current iron ore price and the progress of regional infrastructure developments. In addition, Equatorial is continuing to investigate regional opportunities for partnership and cooperation with strategic investors at a project level, in order to maximise the value of Badondo for shareholders.